Link to the Muggeridge windmill photo collection at the University of Kent. Click on [more] at the end of location in the search/browse box for a full list of the locations in Kent. Just to clarify a few points having read all of the topics. 1) Although the tourist bumph says as much, Herne Mill could not have been built by John Holman in 1789, as he was 12 at the time. help the stability of the structure but it was poor repair which led to the collapse. 3) The dovecote at Cobham is not the base of a windmill; it is too small and isn't recorded on any maps as such. Another hexagonal base does stand off the High Street which was the base of Darnleys Mill, destroyed by fire c.1901. 4) The picture of the two Eastry Mills is of the last two standing. The one in the background is the one that still exists. The mill in the foreground was hauled over by traction engine in 1926. 5) Re: Sarre Mill. As far as I am aware (i was last there in late September) the mill is still a tourist attraction with a tea room. The building behind is used as a holiday cottage let. The mill grinds by engine due to one of the sail stocks being split making it too risky to run by wind. The mill itself is heavily listed so would never be granted permission for any cottage conversion. ; Kent mills were not built in workshops and assembled 'Ikea-style' on site. This practice did happen in Holland. In Kent they were generally built to spec on site, and to the owners potential budget. 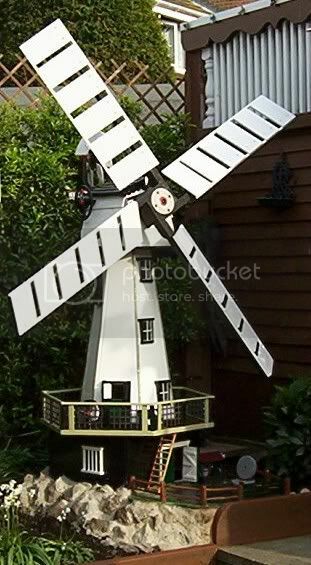 The prevalence of the black painted smock mill particularly in East Kent is due to the presence of Holmans, millwrights of Canterbury, and was their trademark style. Mills were however frequently moved from one site to another, often by sawing down the eight quarter posts and reassembling in sections. One such post is still to be seen at Ripple Mill. Chillenden Mill when rebuilt in 2005-7 was built in a workshop in Reading prior to being transported back to Chillenden. decade. Cranbrook is big enough to accommodate visitors while working by wind. Heres my own in the garden. I built it to amuse the grandchildren .